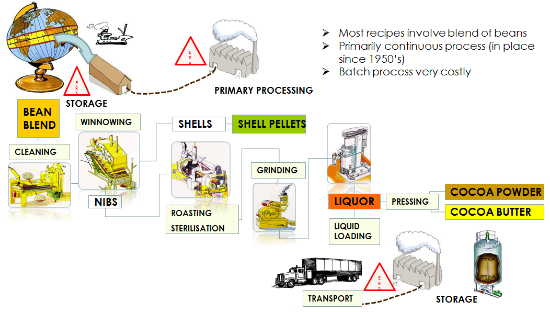 The processing of raw cocoa beans into cocoa mass implies a number of stages. 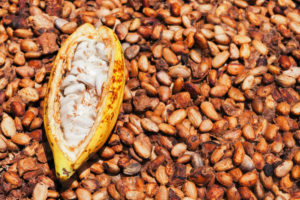 Before arriving at the factory the raw cocoa beans have been fermented and dried, while during transhipment the first quality control has taken place in the port. On arrival at the processing factory the beans are subjected to another thorough inspection, thereafter to be cleaned, mixed into the desired blend, fragmented and stripped of their husks. What remains is the inner part of the kernel, called ‘nib’. The nibs are heat-treated to eliminate possible bacteria and subsequently roasted and ground into a liquid cocoa mass. The nibs are alkalized before, during or after the roasting process. 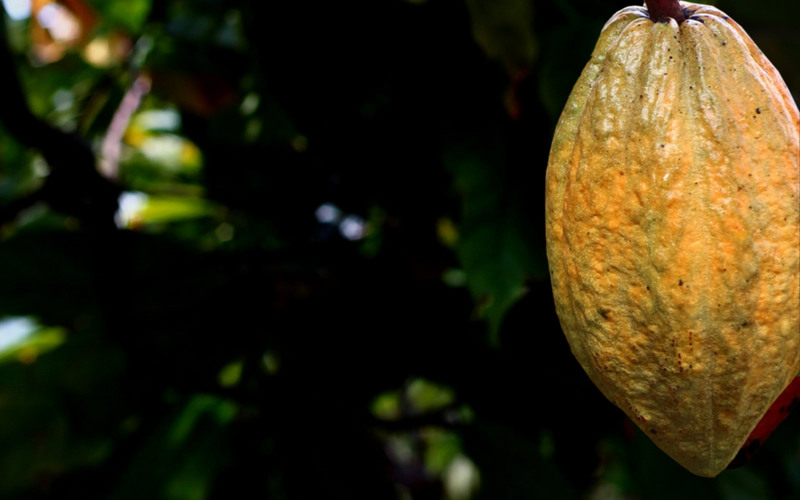 This determines the colour and taste of the cocoa mass, which, as an intermediate or semi finished product, is supplied to the chocolate industry and is also the basis for the production of cocoa powder and cocoa butter. Fat is pressed out of the cocoa mass under high pressure (up to 550 kg/sq.cm). The butter is subsequently filtered, to remove the last remnants of solid cocoa ingredients. The manufacturer supplies the cocoa butter in liquid form in tankers, or in solidified form in cardboard boxes. This product is an important ingredient of chocolate. If the client so wishes, cocoa butter can be made odourless by means of steam and vacuum extraction. 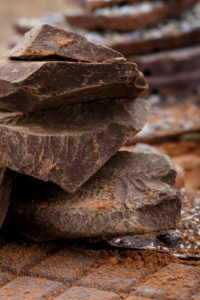 The chocolate industry’s demand is usually for cocoa butter with a neutral taste. Cocoa butter is also used in the production of cosmetics and toiletries. What remains after the removal of the cocoa butter through pressing are cocoa cakes, disks with a thickness of approximately five centimetres. These cakes are broken up and ground into a fine cocoa powder. Each manufacturer supplies its own type of powder, with its own distinctive colour, aroma, pH-value (degree of acidity) and fat content. The powder is the substance which contains the aroma, taste and colour of cocoa. That is why it is the ingredient which is added to numerous food products for flavour and colour: biscuits, puddings, deserts, creams, filled chocolates, ice cream etc. Mixed with sugar and diluted with milk it turns into a mild chocolate drink. It also provides the finishing touch for confectionary, truffles and cappuccino coffee, while new applications are being made all the time. Chocolate is made from cocoa mass, with sugar, cocoa butter and, optionally, milk added. The resulting mixture is rolled and ‘conched’. Conching is a treatment whereby chocolate is kept in continuous movement to allow the cocoa mass to thicken and to develop into a homogenous substance. This process also allows volatile acids to escape, whereby the aroma is improved. Conching lasts for a number of hours. The name originates from the shell-shaped container in which the treatment took place in former days (‘concha’ being the Spanish word for shell). Depending on the desired taste, other ingredients may be added. Finally, the hot chocolate mass must be allowed to cool slowly. This process, called ‘tempering’, is important for the right crystallization of the cocoa butter. After tempering, the chocolate can be poured into any desired form and hardened. During the hardening process the volume of the chocolate is reduced, allowing the chocolate to come out of the mould automatically. White chocolate is made in a manner similar to “ordinary” chocolate, the only difference being that white chocolate does not contain any chocolate mass; just cocoa butter, sugar, milk and vanilla. Until the middle of the last century it was customary for manufacturers to do their own roasting, make semi manufactured cocoa products and, in addition, market their own consumer products. Those days are practically gone. At present two groups can be distinguished in the cocoa industry: producers of intermediate cocoa products and manufacturers of chocolate.